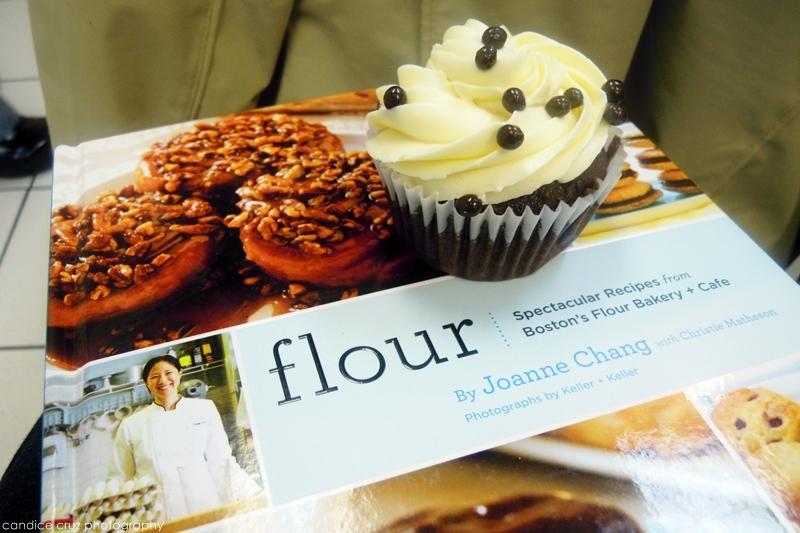 I know that you all know by now how I’m a HUGE fan of Joanne Chang and her Flour bakeries, so it won’t be any surprise that I attended a book signing and demo last weekend to get a copy of her new cookbook. (Wait, you didn’t know that she is one of my idols?! Where have you been??! You must be new to this blog.) 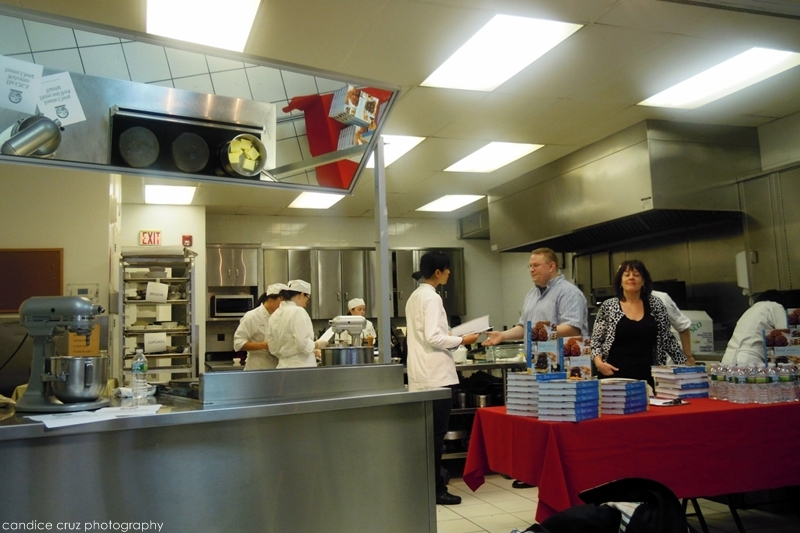 It was last Saturday at the Cambridge School of Culinary Arts and it we had a fabulous time! The session sold out and I think there were about 40 people there. We got there a few minutes before it began so we could see all of the CSCA students, Joanne, and the coordinators scurrying around to get the samples done. It smelled so good in there too! One thing that I really like about her is how much of a good speaker she is. She doesn’t talk down to you when she explains why she does something a particular way, and she always seems to be at ease which makes her lectures/talks more inviting. I love how she explains the science behind things too, and again, in a way that is engaging and not complicated. The first thing she showed us how to make was a pie crust that would later be used for a pear and cranberry crostata. 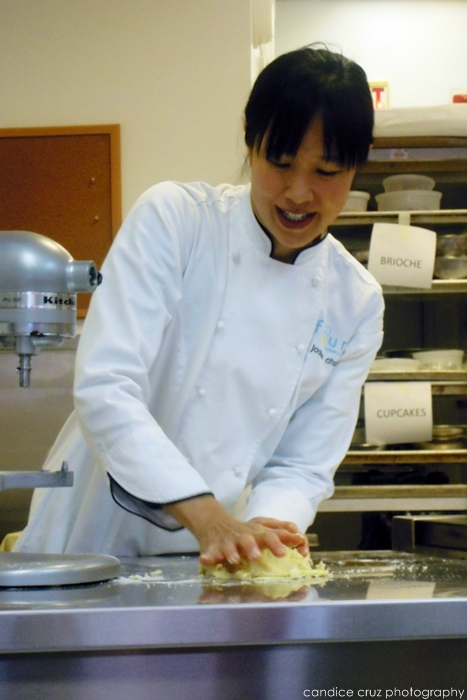 We saw her demonstrate this at the BU event too, but it was neat to see her do it again because I found her advice on rolling out the dough to be super helpful. I have always over worked the dough with the mixer, so to hear and see her explain why it’s best to dump it out onto your work surface before it completely sticks together was a learning experience for sure. It makes sense to me now after she explained the benefits of smearing the little chunks of butter with the palm of your hand, and how you can achieve a flakier crust as a result. What was also great about this talk was how she answered questions throughout the demonstration. I give part of the credit to the audience because people asked some really good questions about why she prefers to use certain ingredients, etc. Plus she has such a good sense of humor and again, I think that helps make people comfortable in approaching her with questions. “So what else did she make? !” you ask. Well aside from the pear and cranberry crostata (which by the way, tasted amazing! 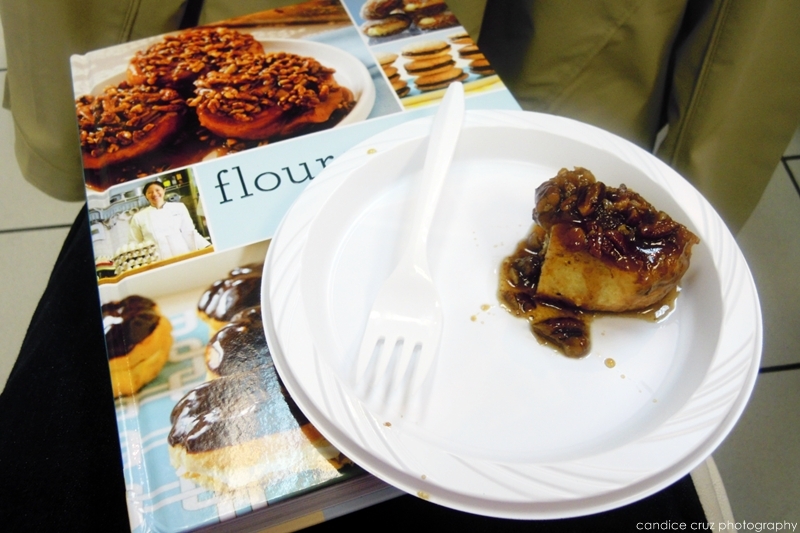 and no, I didn’t eat the whole piece … stupid pear allergy) she showed us how to make the brioche dough to make her famous sticky buns. She also showed us how to make her chocolate cupcakes with crispy magic frosting, which was accompanied by a funny story of how the frosting got its name. (There’s a great article and video of her making these on Boston. com that you can view here.) I will definitely make these sometime because they were amazingly good! She graciously signed everyone’s books after the demonstration and I had a moment where I was almost speechless being face-to-face with her. She actually identified me as ShortcakeScraps because we have conversed a couple of times on Twitter, and of course, I was beside myself in shock!!! I mean, do you know how many people she must see and meet? I was totally flattered that she remembered my name (errr, brand?) at all. Yes, I had to pick my jaw up off the ground. Yes, I will shut up about that moment now. Anyway, I thumbed through the cookbook later that night and bookmarked at least half of the recipes to try to make so stay tuned for photos and stories of my success (and failures!) to be posted here. 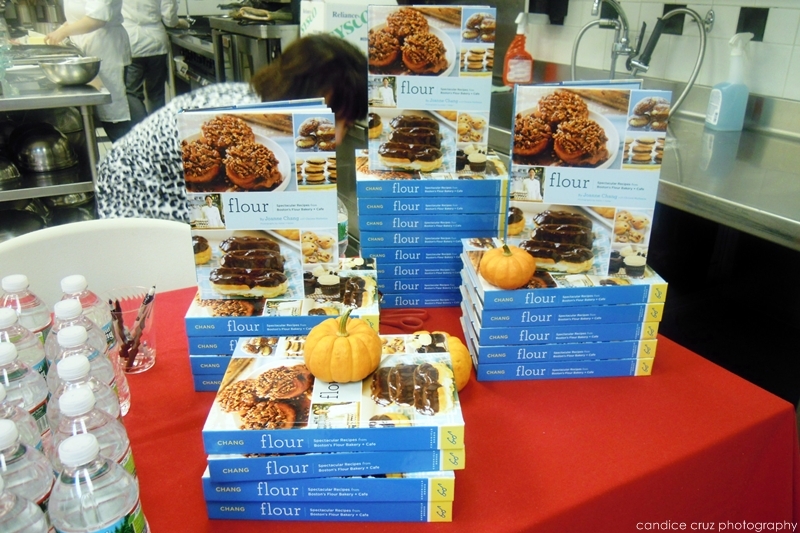 She has a few other book signing events in the near future around town (you can access the calendar here, just scroll down to find it) so if you’re a fan of hers, a fan of baking, or a fan of Flour I would highly recommend attending an event to get your copy of the cookbook. And if you already have the cookbook, be sure to check out the Flour website for a couple of error corrections. This entry was posted in baking, cambridge, cambridge school of culinary arts, cookbook, flour, Joanne Chang by shortcakescraps. Bookmark the permalink.